Gitrob is a command line tool which can help organizations and security professionals find sensitive information lingering in publicly available files on GitHub. The tool will iterate over all public organization and member repositories and match filenames against a range of patterns for files that typically contain sensitive or dangerous information. Looking for sensitive information in GitHub repositories is not a new thing, it has been known for a while that things such as private keys and credentials can be found with GitHub’s search functionality, however, Gitrob makes it easier to focus the effort on a specific organization. Gitrob is written in Ruby and requires at least version 1.9.3 or above. To check which version of Ruby you have installed, simply run ruby --version in a terminal. Should you have an older version installed, it is very easy to upgrade and manage different versions with the Ruby Version Manager (RVM). Please see the RVM website for installation instructions. Gitrob is packaged as a Ruby gem to make it easy to install and update. To install Ruby gems you’ll need the RubyGems tool installed. To check if you have it already, type gem in a Terminal. If you got it already, it is recommended to do a quick gem update --system to make sure you have the latest and greatest version. In case you don’t have it installed, download it fromhere and follow the simple installation instructions. Gitrob uses a PostgreSQL database to store all the collected data. 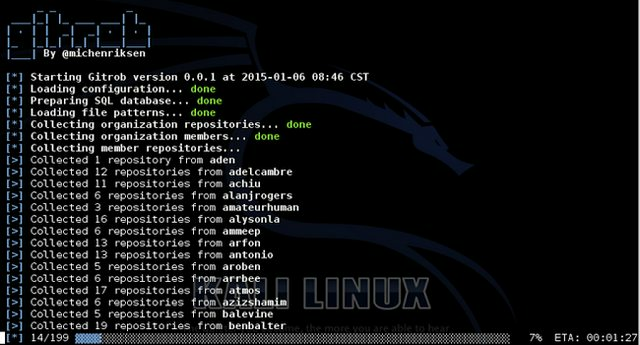 If you are setting up Gitrob in the Kali linux distribution you already have it installed, you just need to make sure it’s running by executing service postgresql start and install a dependency with apt-get install libpq-dev in a terminal. Here’s an excellent guide on how to install PostgreSQL on a Debian based Linux system. If you are setting up Gitrob on a Mac, the easiest way to install PostgreSQL is with Homebrew. Here’s aguide on how to install PostgreSQL with Homebrew. You now have a new PostgreSQL user with the name gitrob and with the password you typed into the prompt. You also created a database with the name gitrob which is owned by the gitrob user. Gitrob works by querying the GitHub API for interesting information, so you need at least one access token to get up and running. The easiest way is to create a Personal Access Token. Press the Generate new token button and give the token a description. If you intend on using Gitrob against organizations you’re not a member of you don’t need to give the token any scopes, as we will only be accessing public data. If you intend to run Gitrob against your own organization, you’ll need to check the read:orgscope to get full coverage. If you plan on using Gitrob extensively or against a very large organization, it might be necessary to have multiple access tokens to avoid running into rate limiting. These access tokens will have to be from different user accounts. This will install the Gitrob Ruby gem along with all its dependencies. Congratulations! The configuration wizard will ask you for the information needed to set up Gitrob. All the information is saved to ~/.gitrobrcand yes, Gitrob will be looking for this file too, so watch out! Mixing organizations and users is convenient if you know that a certain user is part of an organization but they do not have their membership public. When the assessment is finished, the analyze command will automatically start up the web server to present the results. This can be avoided by adding the --no-server option to the command. See gitrob help analyze for more options. See for gitrob help servermore options. If you want to look for files that are specific to your organisation or projects, it is easy to add custom signatures. This signature instructs Gitrob to flag files where the filename exactly matches otr.private_key. The caption and description are used in the web interface when displaying the findings. description: More detailed description if needed (set to null if not). Have a look at the main signatures.json file for more examples of signatures.